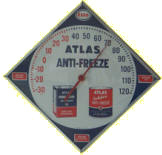 This valuable vintage thermometer advertises the Atlas Anti-Freeze. The thermometer is positioned on a diamond-shaped sign. The circular face occupies the majority of the space on the sign. Two pictures of Atlas products are pictured at the bottom of the sign.